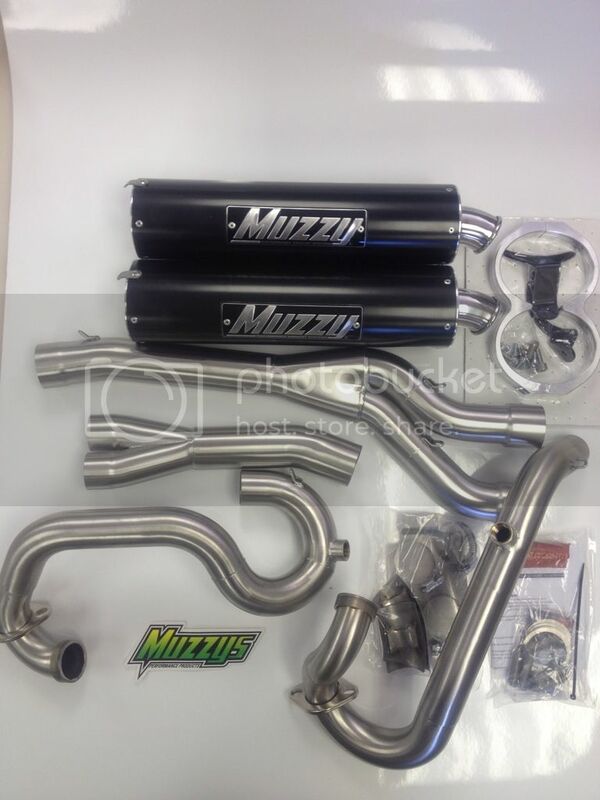 Can am 1000cc Muzzy Dual exhaust BLACK TEFLON CANS. IN STOCK AND IN VERY LIMITED SUPPLIES!!!!! here they are after a long wait. These are just released and in VERY short supply. Single systems are still in the works. I have dynocharts and Digituner settings complete. I will have the PCV settings done hopefully by this weekend. I'll also get dyno video for a sound check. You'll be majorly impressed. it really brings out the sound of the 1000 motor. quiet cores and spark screens included as always. The more I see and hear these the more I like them. Nice! I got bored yesterday and just can't leave well enough alone. I love the sound of these pipes on this motor. They are a hell of a sound for sure. very smooth and not raspy or even too loud concidering these are 14 inch mufflers. so as of last night at 10 pm. I've been working on my renegade and adapting the system to it from the outlander. some 90* bends of 2 inch pipe and I'm all set (on order). I also shortened the cans down for the renegade and they will be mounted sideways. I hope to have it all done and buttoned up by Saturday's ATV ride. or I'll be using the Teryx. I can't sit around and wait for Muzzys to make a renegade system and this is 90% done with the outty 1000 system and the gains are great as far as I'm concerned. so....here's some install pics of the outlander 1000 Muzzy Dual system custom modified to fit on the renegade 1000, I'll make it fit. that's with the outlander 14 inch cans. I've since modified them by about -4 inches and will get the mounting set up today. I need to CNC mill or cnc plasma me out some more brackets. Last edited by VFORCEJOHN; 02-16-2012 at 10:27 AM. They are a hell of a sound for sure. very smooth and not raspy or even too loud concidering these are 14 inch mufflers. I've been working on my renegade and adapting the system to it from the outlander. some 90* bends of 2 inch pipe and I'm all set. I also shortened the cans down to 10 inches for the renegade and they will be mounted sideways. I hope to have it all done and buttoned up by Saturday's ride. or I'll be using the Teryx. Muzzy has a setup for the Renegade now. I like yours better personally. How about gains on the 1g VS the Brute? The pipe is awesome better than the Brute version I think.